Barbi Reuter has long been held as the industry’s gold standard when it comes to social media excellence. She is also well known for her insightful blog posts regarding proper strategies for the use of the latest technology. Every year, Duke Long releases a list of the top ten most influential commercial real estate people on the Internet, where Barbi has reigned as the number one for the past two years. We are happy to have her as a member or our Advisory Board and proud to serve as an additional channel for the broadcast of her unique opinions. 1. 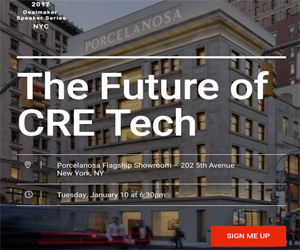 What's the most exciting trend you are seeing currently in CRE Tech? Barbi: Mainstreaming…Awareness and acceptance of tech as a means to an end, whether it be connections, deals, profitability. 2. How do you discover new tech products in the industry? Barbi: Most of the buzz happens through social media – I find most via my Twitter feed, LinkedIn groups, and CRE tech blogs like yours and CREOutsider. 3. What are some of your favorite commercial real estate technology products you use on a daily basis? Barbi: The best app for direct inbound/outbound business I use is CREWbiz – the free member’s only app to connect to any of 9,500 members in 73 cities. Also, as a marketer and networker, anything I can use to sift/filter/curate information to translate it into meaningful knowledge and connections that help our clients and grow our business and brand. Sadly, these usually aren’t CRE specific. 4. What's the one area of CRE Tech you wish you had a great product for? 5. What advice would you give to a real estate professional that is making their first foray into the CRE tech scene? Barbi: Have the end in mind, and don’t get too caught up in process.